At 2962 meters, the Zugspitze is the highest mountain in Germany. It is situated in the Wetterstein Mountains near Garmisch-Partenkirchen and the border between Germany and Austria goes right over it. It is a popular destination for Germans as well as Austrians. 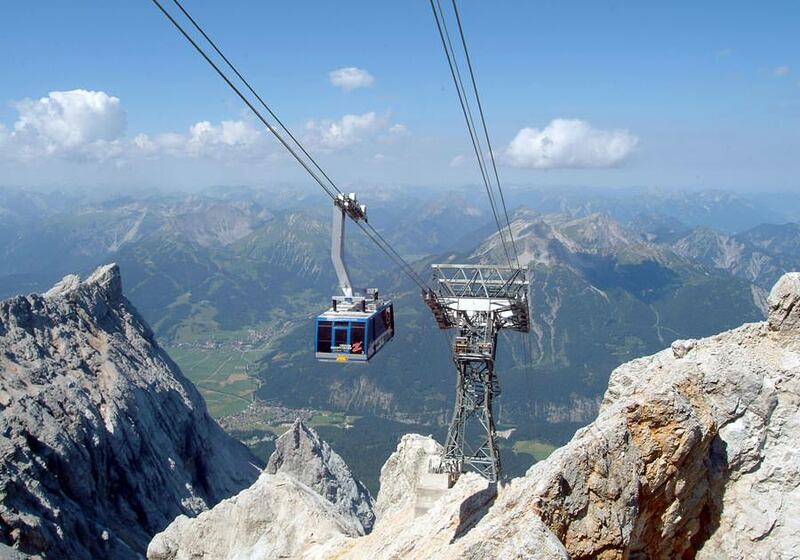 Three cableways lead to the peak of the mountain that had been climbed for the first time in 1820 by Josef Naus. From the Austrian side, that is the Tyrolean Zugspitzbahn, and from the German side, it's the Bavarian Zugspitzbahn as well as the Eibseeseilbahn, that climbs to the peak from the valley-station near the Eibsee. On three normal paths you can also reach the peak; the easiest one leads from Garmisch-Partenkirchen through the Reintal. There is a popular ski area on the Zugspitzplatt. At an altitude between 2000 and 2720 meters, there is a number of ski trails with easy or medium difficulty. Several t-bars and one chairlift provide a seamless and quick transport for the winter sport enthusiasts. In summer, there is the opportunity to get a guided peak tour free-of-charge. The Zugspitze is a mountain with many faces. A peak tour will give you some insight on the myths and stories around the Zugspitze. The guided tour that takes about 20 minutes begins at the times stated on the current schedule at the cashier desks and at the Info-point at the peak. One highlight about the peak is surely the „Faszination Zugspitze – Erlebniswelt … mit den besten Aussichten!“. In this way you can experience the Zugspitze in all its diversity – even when it's foggy, stormy, or snowy.